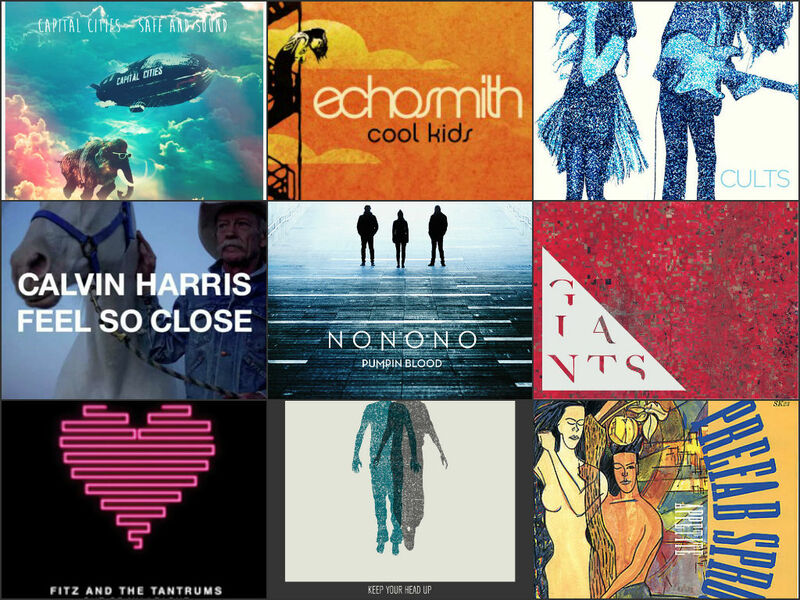 MY PLAYLIST: Top 10 Tracks for January 2014 | THE GOOD . . . THE BAD . . . AND ME. In so doing, I’ve gone through my folders at the very first day of the year and was unhappy about it. Then I went scouring the internet for stuff that I don’t have but have already heard or even loved when I was younger as well as the current ones playing on the radio. Along the way, I’ve found more than I’ve expected. My search yielded more than enough to pamper my eardrums for at least the first quarter of this year. *Disclaimer: This list is in no way associated with any commercial or known music charts all over the world. It is completely mine and doesn’t fall under a particular genre, era or musical style. I love this song. I haven’t really heard any other song from NONONO before I was introduced to this track through the radio last month and it immediately captured my heard. I’m going through some of this band’s songs and so far, I’m liking them all, but this track top the “like” list for me. My soul sister love this group. I think she still keeps a CD somewhere. Of course, being a millenial (Generation Straddler), I was already familiar with their songs and style even before I found out that my soul sister loved them. And whenever their name comes up, it’s always “Appetite” that comes up from the shadows of my mind. From the numerous artists in the 80’s that intensified my love for music, Prefab Sprout as well as the other bands and artists under the “sophistipop” genre, balanced out the punk sounds inherent of 80’s new wave and the corniness of 80’s pop for me. Through it all, this band has been inducted to my very own hall of fame. I have professed my love and affection for Ben Howard and his music time and again. And I cannot help myself from squeezing him into another playlist for times when I need a dose of Ben’s emotion-filled songs. Apparently, I need those doses at least 3 days out of a month. Go figure. Never was a cool kid in school and never wanted to be. As a veritable introvert, I hate been in the spotlight. But somehow after listening to this song and sentiment behind it, it made me realize that there’s a part of me who wanted to be cool — in a different way. I wanted to be a “radical” cool kid whom no one wants to mess with. I wanted to be the cool kid that’s automatically respected not because I’ve got the funkiest haircut ever or I have money to burn. I wanted to be the cool kid because of the very thing that separates me from the “it” kids in school. First, there was Out of My League (which was included in my August 2013 Playlist)and now comes this song. This band is definitely tightening its net around my musical heart. I wished for something unique and the heavens answered with Cults. They definitely sound unique; it’s what one call a signature sound and I like it. The message of the song resonated personally to me, too — a fierce combination, if I may add. Honestly, I didn’t care much about the intro of this song, but that didn’t deter me from listening to the entirety of it. Call it curiosity, or something akin to challenging myself not to judge a song by its intro. My challenge was met and I was hooked. Soon, I’ve been playing this song on repeat in the morning while I do my stretches. So far, this is the only song I have my greedy hands on and I plan to look for more from this band and infuse it in my eardrums as soon as possible. Just glad I stumbled upon it during my unscheduled forays around the web. It’s catchy and I love it! It’s surprising that I would love this since it’s one of those songs that got a lot of attention (commercially speaking) and spawned so many acoustic versions in YouTube — not to mention audition pieces in some popular talent shows. But then (like the spirit of Billy Idol possessed me and I started yelling ‘Rebel Yell‘ inside my head), I don’t f**king care. I like it — enough said. I’ve always loved Calvin Harris the moment I heard his single I’m Not Alone (from his album Ready For The Weekend) back in mid-2009. From then on, I’ve kept my ears open to this Scottish artist. Fast-forward to 2012, I heard this track (from his second studio album 18 Months) and after a few listens, totally forgot about it. Then lately, as I searched what’s new with Calvin, I realized I loved this song and got a copy. Soon, it became one of my obsession this month. It’s a great track to workout and to just feel good! That’s it, folks! Till next time!